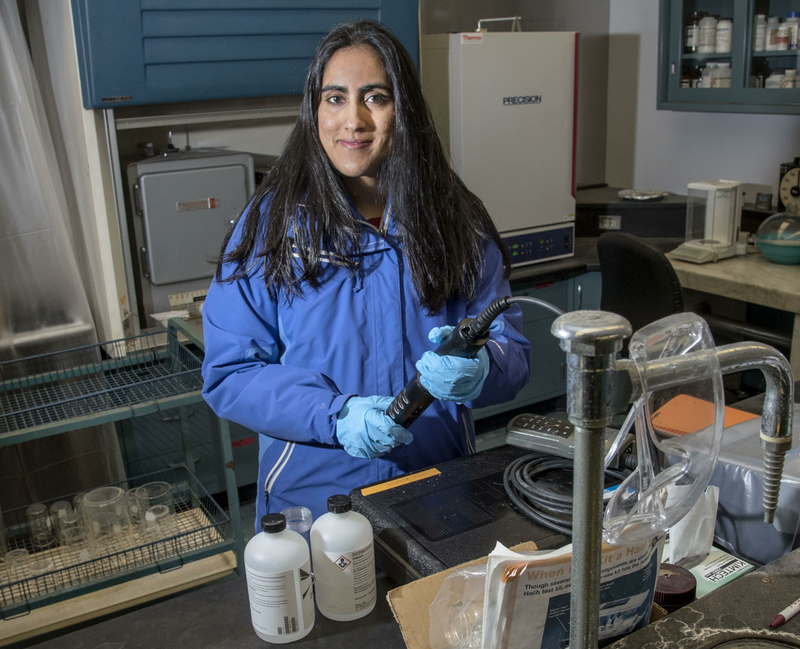 Nina Kshetry used AWARE to jumpstart her company, Ensaras, which develops analytical tools for wastewater treatment plant operations. Nina Kshetry admits she always had “the entrepreneurial bug.” A decade after reaching the semifinal round of the 2006 MIT $100,000 Entrepreneurship Competition, she was finally ready to move forward with her company Ensaras, Inc., a Champaign-based startup that develops predictive analytics and artificial intelligence tools and devices to optimize wastewater treatment plant operations. To get started, Kshetry needed a way to not just receive funding, but get connected to other entrepreneurs and she found that with AWARE (Advancing Women and Underrepresented Entrepreneurs). The program, sponsored by the Technology Entrepreneur Center and the University of Illinois Research Park, is now in its third year and targets support for women and underrepresented groups in an effort to bring them into the vibrant entrepreneurial ecosystem at Illinois. It has also become a model that other universities have adopted. Kshetry is just one of a number of success stories for AWARE, which was kick started in 2015 by a $100,000 grant from the National Science Foundation. Through programs like the Cozad New Venture Competition; collaborative space like the Enterprise Works incubator, or through advising, which has guided startups in successfully raising millions of dollars in seed funding, the University has been intentional in building a community and providing student and faculty startups the tools necessary to turn developed technology into commercialization. Despite these efforts, leaders within the ecosystem recognize the additional challenges that women and members of underrepresented groups have in even becoming a part of that community. To address these issues, Bleill and Jed Taylor, the Director of Operations for the Technology Entrepreneur Center on campus, were co-principal investigators on the NSF proposal for AWARE. The ultimate goal is integration. As Bleill and her team were investigating elsewhere for ideas, they discovered that many programs have special workshops just for women or underrepresented groups, but those individuals still often feel isolated. Through AWARE, successful female entrepreneurs like Jackie DiMonte, speak to those at the beginning stages of the process. 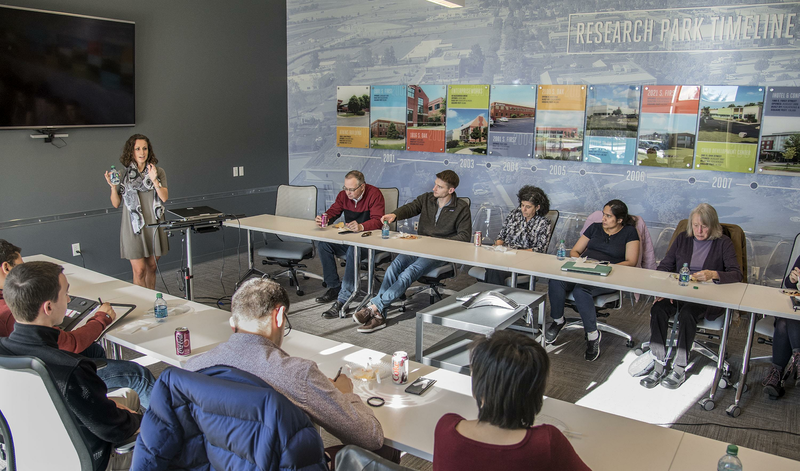 Jesus Soriano, NSF program director, was aware of some of the existing success Illinois had in attracting underrepresented groups through the local I-Corps program, where Taylor and Bleill, and others were heavily involved, and encouraged them to apply for the grant. I-Corps, an NSF-funded program, prepares scientists and engineers to extend their focus beyond the university laboratory, and accelerates the economic and societal benefits of NSF-funded, basic-research projects that are ready to move toward commercialization. A major objective of AWARE is to provide a bridge to I-Corps. According to Taylor, that is done through three avenues. The first is to encourage women to attend workshops or other networking events with successful female entrepreneurs. Secondly, it is to provide up to $5,000 in proof-of-concept funding to help them develop a viable product. The third piece is to foster female Entrepreneur-in-Residences, which offers one-on-one support. The program allowed Research Park to hire Karin O’Connor as its second Entrepreneur-in-Residence. O’Connor was the managing director for Chicago’s largest investment network, the Hyde Park Angels. Quite simply AWARE meets prospective female entrepreneurs where they are. For instance, in many case there are challenges as it relates to caregiving responsibilities while also being the primary breadwinner for the family. While Bleill admits that the “needle is moving” in the right direction, she admits that AWARE has a lot of room to grow. In just over two years, AWARE has produced tangible results. Its participants have successfully applied for grants through I-Corps and its successor SBIR (Small Business Innovation Research). Ensaras, for example is currently working on a Department of Defense SBIR Phase 1 project to develop an automatic wastewater classification device for the U.S. Army using smart sensors. They are also actively marketing their advanced analytics solutions to municipal and industrial wastewater clients. “The AWARE program and EnterpriseWorks have made me feel part of the local entrepreneurship community, which is important since as an entrepreneur you can often spend a lot of time working solo,” Kshetry concluded. “The resources and programming through AWARE and EnterpriseWorks have been amazing, and have helped me through the entrepreneurial journey.